In last week’s post, we covered foundational details regarding PIM in modern wide-band and multi-carrier communication systems, with a note on upcoming 5G NR sub-6 GHz frequencies being added to the mix. This week’s blog expands upon that discussion and provides more details of PIM considerations specific to DAS. With DAS, another large PIM concern is the metallic structures within buildings, transportation stations, stadiums, and etc. that are nearby the remote radio heads (RRH) or distributed antennas. If there are any metallic structures within a few wavelengths of the antenna, then reflections with distortion products could be received by the antennas, amplified, and carried to a receiver. 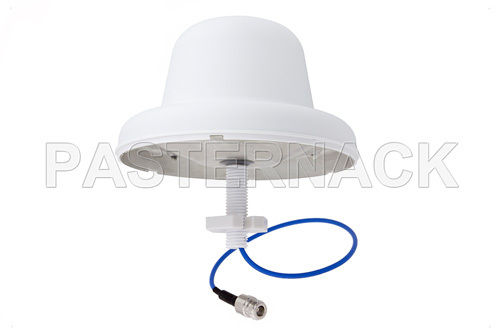 There are a variety of low PIM antenna technologies, as well as quasi-Omni antenna and the use of multiple directional antenna precisely positioned to have antenna patterns that avoid PIM generators in the environment. Also, many DAS installation mechanisms allow for changing the position of a RRH or antenna tens of centimeters, which can significantly reduce the strength of environmental PIM generators. Moreover, PIM transmitted and generated within the environment by other RRH, DAS antenna, and other wireless communication systems could also impact wide-band DAS in hard-to-predict ways. The reason multi-carrier and multi-frequency systems are more challenging to predict is that with each additional signal, the mixing products become much more complex. Additionally, there are additional temporal considerations for PIM in DAS systems, as the environment and signals around the DAS is likely non-static. Hence, changing environmental components could lead to PIM generated at different times and in impossible to diagnose situations. Therefore, it is often beneficial for DAS installers to ensure that the entire system exhibits as low internal PIM level as possible, which makes detecting, identifying, and troubleshooting external PIM factors easier and more reliable. Another area of concern for DAS systems and PIM are the large amount of connectors, adapters, combiners, splitters, couplers, hybrids, attenuators, and other passive components that are often installed in-line to the transmission path. The cables, interconnect, connectors, and metallic features of any of these components could generate PIM, and unless they are tested once installed, their installed PIM performance may be very different than what is indicated on the datasheet. This is especially a concern for components with ferromagnetic and ferrimagnetic elements. Though ferromagnetic metals and components can be avoided with PIM susceptible systems, it is often difficult to avoid ferrimagnetic components, such as isolators, circulators, and phase shifters, which tend to produce higher levels of PIM than other components. Also, the proximity of a component to a signal source impacts the strength of the distortion products generated. Therefore, placement and planning of connectors, passive, and even active components, can have a significant effect on the amount of PIM reflected back to the receiver. Another important factor to consider is superposition, in that every distortion product that is generated will form a compound reflected signal. With complex DAS, this could lead to several distortion products within the receiver’s bandwidth combining power, which makes such complex multi-carrier DAS systems even more susceptible to DAS with increased opportunity for higher power distortion products from combinations of even low power transmissions.